Sung Kang, Chris “Ludacris” Bridges, Gal Gadot, Vin Diesel, Paul Walker, and Tyrese Gibson gather for more high-octane action in ‘Fast & Furious 6’. A funny thing happened at the megaplexes last summer. That was when Fast Five debuted, and unexpectedly crystallized the formula of what had to that point been a very formulaic franchise. The restraints came off, any last remaining vestiges of logic were shed, and a ragtag group of action heroes were assembled with Avengers-esque grandeur for one of the dopiest, most entertainingly absurd B-movie spectacles ever filmed. Believe it or not, Fast and Furious 6 manages to one-up the previous installment; not by raising the stakes of the formula but by refining it. Fear not, die-hard fans: The mostly vehicular mayhem and freewheeling hijinks are still there, but the overall volume is no longer cranked to 11. One reason why the series has managed to so much mileage is by re-inventing itself with nearly every installment, from “Point Break with cars” cop drama to high school melodrama to Ocean’s Eleven-style caper dramedy. This time, it veers into Mission: Impossible secret agent territory, complete with megalomaniacal über-villain, exotic locales, and a race to save the world. 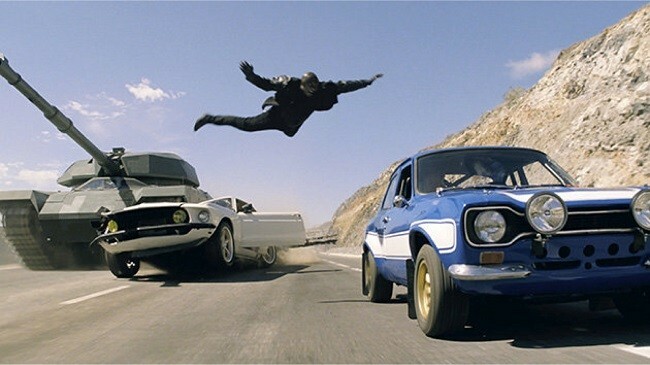 This latest chapter in the ongoing saga of street racers-turned criminals-turned Robin Hood heroes finds Dominic Toretto (Vin Diesel), Brian O’Conner (Paul Walker), and the all-star multi-national crew (Tyrese Gibson, Sung Kang, Chris “Ludacris” Bridges, and Gal Gadot) mined from previous installments living large on the proceeds after stealing $100 million in cartel money in part five. Agent Hobbs (Dwayne Johnson in number four of the five movies he’s appearing in this year), who so relentlessly pursued the team in Brazil, comes to them with an offer: Help him take down mercenary Owen Shaw (Luke Evans), who’s one component away from assembling a super-weapon worth billions to the highest bidder, and he’ll get them pardoned for their past crimes. He makes the offer even more enticing for Dom by showing him evidence that his late gear-head lover Letty (Michelle Rodriguez) is alive and working for the opposition thanks to a bout of amnesia. Like the Magnificent Seven with hot rods instead of horses, they ride into action to fight, shoot, race, do battle with a tank on the Spanish highways, and take down a cargo plane on what must be the world’s longest runway. The action is cartoony (with at least a half-dozen death-defying leaps to and from moving vehicles), and the dialogue is mostly one-liners and exposition. And, dammit, it reminds us that over-the-top action movies can, and should, be fun. The highlight: An epic throwdown between Letty and Agent Riley (MMA fighter turned actress Gina Carano, Haywire) that may just be the best girl-fight ever filmed. Justin Lin’s direction is more matured and confident now than it has ever been, relying less on action beats and visual flourishes and taking some time with the characters and story. Courtesy of returning screenwriter Chris Morgan, there actually is an unexpected investment in characterization. Granted it’s all melodrama, with Dom hellbent on redeeming Letty, and Brian is constantly looking over shoulder out of fear that he won’t be able to protect his wife (Jordana Brewster) and baby, but Lin and Morgan are aware of the material’s limitations. More importantly, this installment drops the self-serious tone that has dogged pretty much the entire series, and the cast has more of an ensemble feel. As large as it is, everyone has his or her moment. With its alchemical mix of stylized car chases, hand-to-hand smackdowns, sense of honor, emphasis on its ad hoc family unit, comic book-style continuity, and narrative fearlessness, what by all rights should have been a throw-away series of half-assed action movies has instead generated a unique oddball mythology. It’s the Le Morte d’Arthur of cheap thrills cinema. Lin is stepping away from the franchise after directing the previous four, so who knows what to expect from the next one (already in production), though a pre-credits teaser provides a hint of when and where it will be set, as well as a surprise cameo from the F&F team’s next nemesis. Even a casual viewer may find him- or herself anticipating Fast & Furious 7.